Being raised in West Texas, I have experience with cowboys. I’ve taught and been taught by them, worked with them, listened to their poetry, and eaten their food. My cowboys are the real, working men who get their hands dirty, but have never (to my knowledge) been in a shoot out. This, however, does not diminish my love for their literary counterparts: the lean silhouette against a sunset, hat tipped, cigarette dangling, gun at hip. Whether L’Amour or McMurtry, Shane or Cool Hand Luke, Gunsmoke or Deadwood, I, like most Americans, have grown up with the cowboy, a unique character spun from the past that has become part of our mythology. These peculiar characteristics would find their home against backdrop of the neutral West, with the cowboy a hero the divided country could root for. Despite a general dislike of British traditions during this time, writers like Owen Wister and Zane Grey sculpted the cowboy from the central figure of the British knight in popular tales of King Arthur and Robin Hood. During my graduate Arthurian Literature course, we were asked about the survival of knighthood chivalry in the the American cowboy. Pregnant at the time, I gave an emotional answer about the cowboys I knew, like a man at work who was so concerned I wouldn’t have a ride to the hospital due to my husband’s work schedule, he insisted on giving me his home phone number (he also brought me pie every week). On a literary level, comparing the two had not crossed my mind until then, but the similarities are evident. Horse-reliant wanderers, they are symbols of gallantry and masculinity forged during times of social and economic change. The cowboy rode out of the Civil war; the knight rose to popularity in the waning years of feudalism. Beyond a military figure, the literary knight was romanticized with a chivalric code, and became a dispenser of justice and bringer of order. Similarly, the American cowboy character, removed from the actual vocation (and not to be confused with other cowboy types such as the vaquero, gaucho, or buaso), represented an ideal separate from the feudalistic South and industrial North — Anglo, stoic, spiritual, self-reliant, and detached from the corruptions of society. As with the knight, the cowboy was tasked with settling the West and maintaining order in whatever way he might define it. The West became a place of black hats and white hats where moral order reined above all else. On that front, while the knight might answer to a king, the cowboy answered only to himself (and God), allowing him, like America, to construct his own rules and identity, a prime example of the “American Adam” described by R.W.B. Lewis. The cowboy also owes his construction to exaggerated legends of real, still-living men. The existence of a historical Arthur or Robin Hood warrant continued debate; men like Jesse James and Wyatt Earp not only existed, but achieved celebrity because their exploits were sensationalized in newspapers and dime novels, blurring the line between fact and fiction, folk tale and journalism. 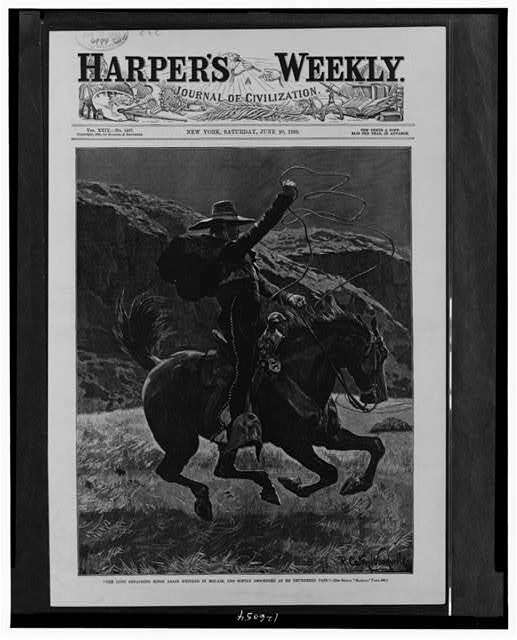 Wild West shows became the stomping ground for those swept up in the romance of the fictionalized West, selling the American people its lawlessness as entertainment. Controlled and bereft of real danger, it allowed people to experience the lifestyle from a safe distance that kept the image intact. With time, the cowboy would add singer, poet, and entertainer to his list of achievements, the character appearing in multiple mediums while still maintaining the basic elements developed by those early writers. Like Arthurian lore, the cowboy would be redefined and rebuilt each generation, at once thoroughly American yet malleable for stories representing a wildness and code of living, no matter the time or place. Part of the continuing appeal might be the paradox of morality—the cowboy’s untamed toughness is tempered with personal ethics that make him a moral equalizer, a purveyor of justice outside the law. Because this can best be tested in places where wildness still exists, it makes sense that the cowboy of today is often sent into space for a Woody meets Buzz Lightyear smashup of tradition and technology. No matter his location, the literary cowboy will never truly be tamed. His rejection of the societal trappings is crucial, as he is not part of any specific social class. In fact, attempts to civilize him end poorly (or comically as the story calls for it). The literary figure of the cowboy might have been constructed as a part of nationalist sentiment, but he has come to represent an ideology that is inseparable from America (as evidenced by the many times Team USA athletes have entered an Olympic stadium in cowboy hats). Perhaps because the cowboy icon is such a part of our culture, he cannot be assigned to any other nationality, and he continues to garner invitations to the range of imagination. In the coming months, I will be walking through the cowboy’s peculiarly American history in literature from his development in Wister’s The Virginian to his deconstruction in recent years on the page and screen. So saddle up, and get ready for a ride!